Prof. Chandra Reedy's digital image analysis reveals crystals in the glaze of an ancient Chinese ceramic piece. A nationally renowned scholar on the preservation of ancient Chinese ceramics, Prof. Chandra Reedy is applying digital image analysis to study the technology used to produce glazed ceramics of nearly 1,000 years ago. She has developed protocols for light microscopy in conservation research, publishing her most recent findings in Studies in Conservation, and she is now beginning a two-year project to combine her laboratory work in UD's Center for Historic Architecture and Design with field work in China. "Ceramics are an integral part of China's national identity, and many ongoing efforts are aimed at understanding, supporting and even attempting to revive lost or disappearing traditional ceramic craft technologies," she said. Through a partnership among the University of Delaware, the Palace Museum in Beijing and the Sichuan Province Cultural Relics and Archeology Research Institute, Reedy will use light microscopy and digital image analysis to study the Song Dynasty (960-1279 A.D.), a period of great creativity and technological innovation. 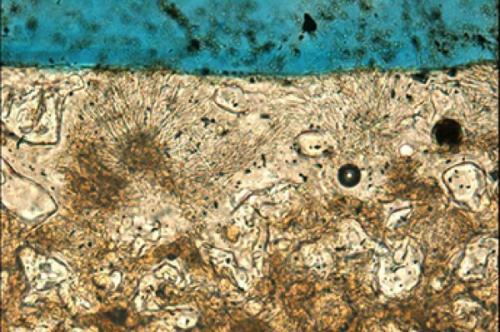 The period is marked by state-of-the-art advances in the microstructure of ceramic bodies and glazes, processing and fabrication techniques, firing regimes and the resulting optical properties. "By better understanding the technological variability, I hope to better understand the extent of that creativity and discovery, as well as the underlying knowledge and skills required to practice this technology," said Reedy. Her ultimate goal is to reconstruct the full range of technologies used to produce each of the Song Dynasty's "Five Classic Wares," the five main types of ceramics to emerge in this period. Reedy also hopes to examine the pace and extent of technological experimentation and change that occurred as well as to study how the ceramic's aesthetic and functional aspects were affected by such technologic innovations.